"So, what are you doing here? Oh, really? You should wait for your friend at a library. Or a park. Don't you think?" This is what it sounds like when the police ask you why you're sitting outside a veterinarian's office talking to your MacBook at a rainy 1:00 a.m. To be sure, you'll probably omit a lot of unnecessary details - that your girlfriend happens to be on the other end of the computer screen, that you've been "waiting for your friend" there intermittently for the last two weeks because it's the only nearby open wireless access point, that you're looking up apartment listings because you're crashing on a friend's dorm room floor that you're not even supposed to be in - but when you're an American international student in Japan, you probably don't want to explain that kind of thing in your fresh-out-of-college Japanese. You'll probably just be relieved that you had your passport on you, that the worst they did was write down your information and you'll retreat to your illicit flop house with a quickness. At least, that's what I did. Then, after borrowing a page from Grand Theft Auto, I changed out of my board shorts and flip-flops into a hoodie and blue jeans, grabbed my Coral Pink Nintendo DS, and headed back out into the night to find a way to explain to my wonderful girlfriend why her wonderful boyfriend just got his I-love-yous cut short by Japan's Finest. 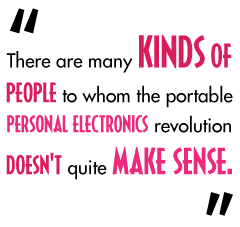 There are many kinds of people to whom the portable personal electronics revolution doesn't quite make sense. These are the people who have a computer at home and another at the office, a nice TV in the living room and a big old Xbox 360 in front of it, and probably a pretty slick sound system. Some people like this can still understand the appeal of a laptop computer, or a portable game console, or an MP3 player, sometimes, if they have a plane trip. But there is another kind of person who can wholly appreciate living in an age where days of music, hours of quality videogames and a full-fledged computer are readily stored on his person. This is the kind of person who doesn't have a place to put a nice TV or a sound system or an address at which he could sign up for an internet connection, and thinks it's really nice that he can still do things like make a few bucks here and there as a freelance writer, or maintain a relationship with his favorite person in the world, while he's, uh, "in a transitional phase." Alas! Sometimes the police - or the concerned business-owners who call them - are not so charitable, and all of a sudden loitering with a laptop doesn't seem to be such a good idea.